ALTHOUGH HE NEVER won a world title, many a world champion, if they were alive today, would attest to the greatness of Joe Choynski. He was born on Nov. 8, 1868 in San Francisco and grew up just a few blocks from future heavyweight king, and rival, Jim Corbett. 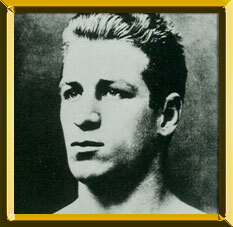 Choynski, who would eventually grow to 5'10" 172 pounds, had good boxing skills, but it was his toughness and awesome power that won him the respect from such all-time greats as Corbett, Jim Jeffries and Jack Johnson. He is also considered the greatest Jewish heavyweight in history. He was the son of a Jewish immigrant who emigrated from Poland in the 19th century and eventually settled in San Francisco. The man known as "the California Terror" and "Little Joe" began his amateur career in 1884 and went on to win the Pacific Coast championship in 1887. He turned pro a year later. At the time, the City by the Bay was the epicenter of boxing. His hometown rivalry with Corbett featured three epic battles in 1889. The local police interrupted the first contest, on May 30, and the fight was declared "No Contest" after four rounds. They met again six days later and this time Corbett out lasted Choynski, scoring a 27th-round knockout. Corbett also got the best of his rival on July 15, being declared the winner after four rounds. During his career, which spanned 16 years, Choynski battled all the top fighters of the era: Bob Fitzsimmons (D 5, stopped by police), Kid McCoy (Exh. 4, L 20, D 6, KO by 4), Tom Sharkey (L 8, D 8, KO by 2), Denver Ed Smith (WF 4), Peter Maher (KO by 6, W 6, KO 2), Joe Walcott (KO by 7), Jack Johnson (KO 3) Philadelphia Jack O'Brien (L 6, ND 6) and Marvin Hart (ND 6). He also fought an exhibition against John L. Sullivan in 1891. During an interview in 1940, Hall of Famer Jack Johnson reminisced about the hardest punchers he faced. "Jeffries No. 1? No, sir. Give me Joe Choynski anytime. I faced both and should know. Jefferies had a powerful wallop, but Choynski had a paralyzing punch. His left hand was a corker. He was the hardest puncher in the last 50 years, with Joe Walcott a close second. I think his left hook was even more effective than either Dempseys." A review of Johnson's record shows that Choynski is the only man to knock out the former champ besides Jess Willard. Corbett was no less laudatory, "Little Joe was the hardest hitter I ever tangled with. To this day I can't figure out how a runt like him could hurt so damned bad." Choynski gave Jefferies an unceremonious welcome to the upper echelons of the divisions. During their grueling 20-round bout on Nov. 30, 1897 in San Francisco, he nailed the future champ with a left hook to the mouth that broke clean through his lower lip, leaving his teeth exposed. Jefferies later said it was the hardest he'd ever been hit. After his retirement, Choynski remained active in boxing. He was an instructor, and worked on the promotions of championship bouts, including the Johnson vs. Jefferies showdown in 1910. He eventually went into business and settled in Cincinnati, where he died in Jan. 25, 1943.